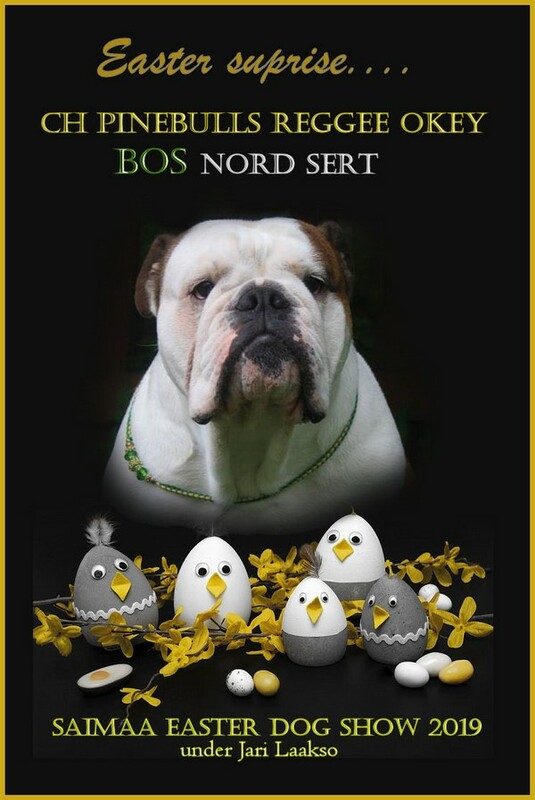 SAIMAA EASTER DOG SHOW 2019 was kept in Imatra 21.4.2019. 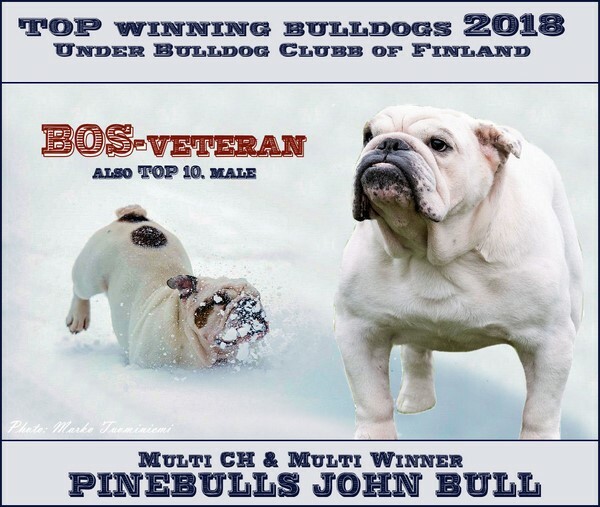 CH Pinebulls Reggee Okey,PATUKKA was beautifully handled by his owner Tuula Simola and PATUKKA was BOS with NordSERT. Judge in the Show was breedspecialist Jari Laakso. 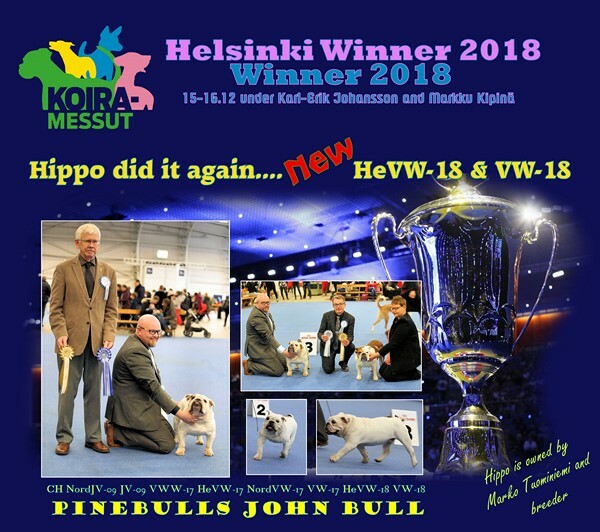 HIPPO, CH Pinebulls John Bull take two new titles at Helsinki Winner and Winner Show at Helsinki 15-16.12.2018. At Saturday HIPPO got HeVW-18 title and at Sunday VW-18 title. He was BOS veteran at both days and his beautiful daughter TYYNE, CIB Möwens On And On was BOB-veteran. At Saturday also CH Pinebulls Reggee Okey was BD3 with great critique. 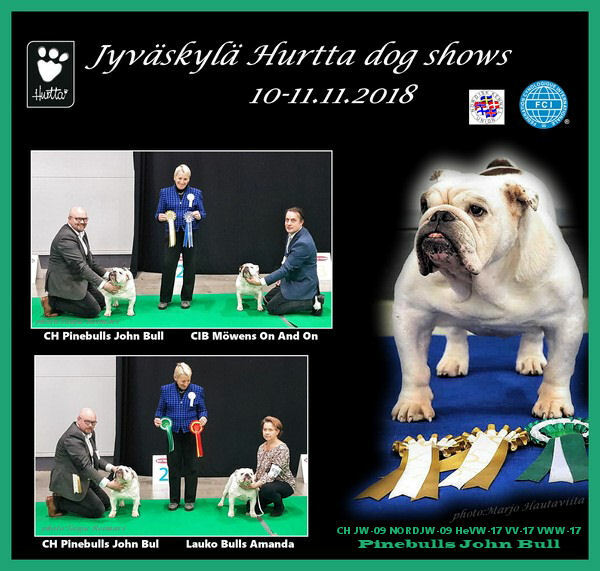 10-11.11.2018 at Jyväskylä Hurtta dog shows HIPPO, CH VWW-17 Pinebulls John Bull did great job with his handler and co-owner Marko Tuominiemi. On both days HIPPO was BOB-VET and his beautiful daughter TYYNE, CIB Möwens On And On was BOS-VET. Also on Sunday HIPPO was best male and BOS! Judge at Saturday was Margaret Wildman and on Sunday Lew Olson. In a few weeks Pinebulls N-litter celebrates their 8th Birthday. 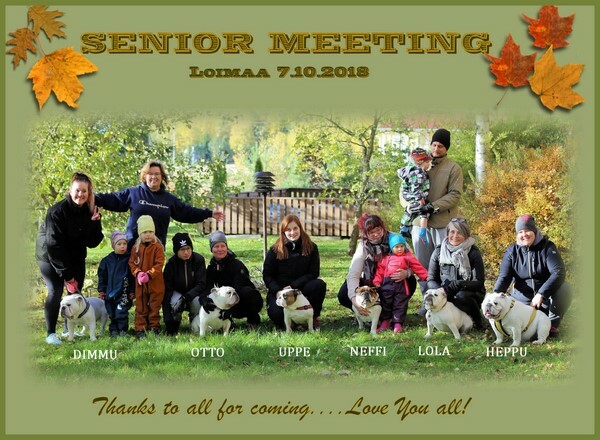 Whole litter with nine puppies are still doing well and here at Loimaa there was six of them. Litter is out of combination CH VWW-17 Pinebulls John Bull and Pinebulls Harlequin. Thank´s to You all coming and making such a lovely day together!